Dunelm Carpet Cleaning Services is not a franchise, I am the owner operator of this company with over 30 years experience (established 1981). I carry out all work myself and under no circumstances do I subcontract work out (as some companies do). 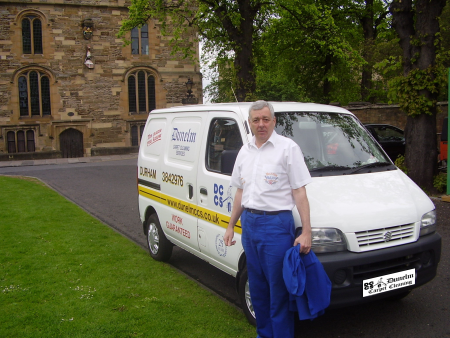 Being a Durham based company I am able to offer my services to all surrounding areas within a 15 mile radius. All work is guaranteed and I have been a member of the Guild of Master Craftsmen since 1990 and have followed their maxim of Honesty, Integrity, High Standards and Value for Money. I also carry a £2m indemnity Public Liability Insurance. I use the hot water extraction system: pre-treating and agitating first, then cleaning. This means the items stay clean longer due to the reduction of any residue. I will move furniture at no extra cost and put protection under them, carpets can be walked on straight after cleaning. Address: 19 Mossdale, Cheveley Park, Belmont, Durham. DH1 2AZ | E-mail: david@dunelmccs.co.uk We will endeavour to respond to all E-mails by the end of each day.